Debt Funds provide lower but relatively stable returns as compared to equity funds. They provide stability to a portfolio as they trade in the fixed income market which is more stable in comparison to the stock market that impacts equity funds. Everyone needs a financial plan that’s designed to meet various financial goals in the future, like kid’s college education, medical expenses, house, retirement, etc. We invest our money in different assets like property, gold, stocks, Mutual Funds to achieve different financial goals that arise at different points in our lives. 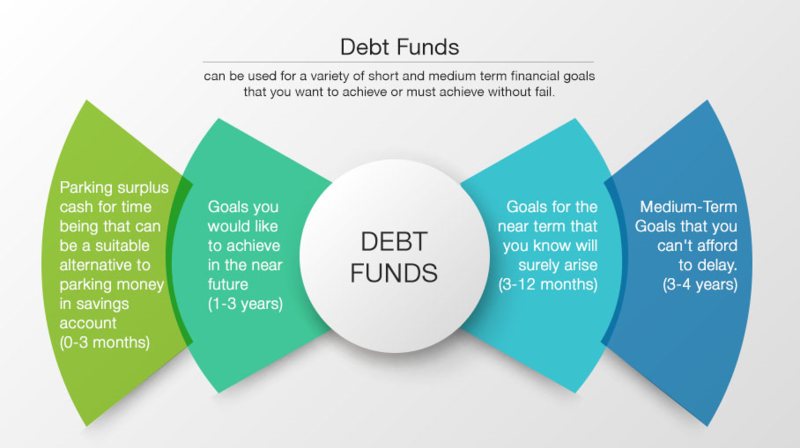 Debt Funds are most suited for goals that are short-term in nature, as opposed to equity funds that are suitable for long-term goals like retirement planning, given their volatile nature in the short-term. Some Debt Funds like Liquid Mutual Funds are suitable for parking your money for few months if you’ve received a bonus or sold some other investment and are deciding on what next to do with the money. Debt funds are also suitable for goals where you don’t want to take the risk of failing to fulfil it, like the college education money that you want to withdraw in 2 years’ time. You can invest your money in a fixed income fund for such kind of goals. Thus, debt funds should be a part of every financial plan.